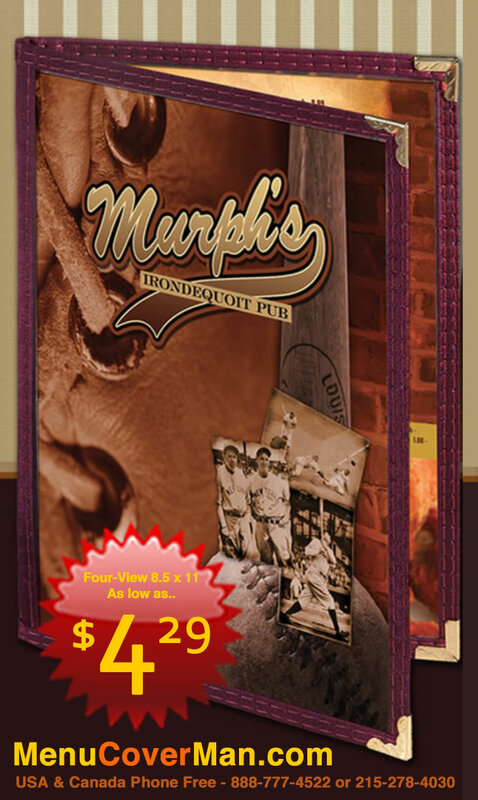 • Most of The MenuCoverMan’s menu covers can be customized with your logo or establishment name by fabrication of a metal die to imprint and recess your logo onto your product. Once created, that die will belong to you, and be stored by us, for future work. • Foil stamping (imprinting and recessing with color) or Blind Debossing (imprinting and recessing without color) are available. 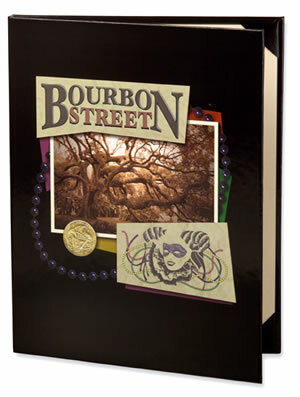 • You can also choose from MenuCoverMan products that utilize your own artwork or image (Digitally or Engraved). • Most of the Menucoverman's products are made in the USA & Canada. A handful of products are imported from Asia. · Lettering 24 pt minimum. Logos not submitted in a useable format may be reworked by our Art Department with your approval for a standard $90/hour charge. We are happy to set type if you don't have artwork. 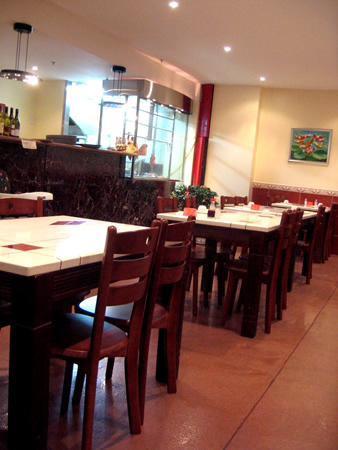 We can present your restaurant's name in a wide variety of typestyles for your perusal. The art work die fee charge is $75. Please provide your recommended font, font size (lettering 24 pt minimum), as well as your layout and positioning of the text on the cover, or call 888-777-4522 to discuss your ideas. 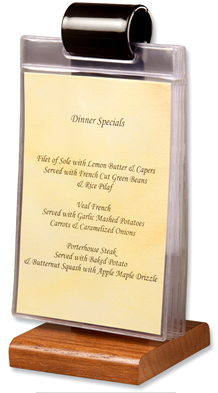 Click on this line to view high-resolution sample typestyles for your menu covers. 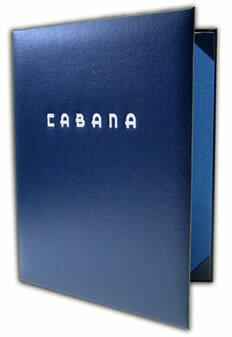 Logo, each color (one die, one size): $75.00 One-Time Fee (not incurred on re-orders); No per-menu-cover stamping fee. 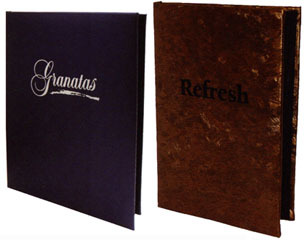 Second Stamping Fee $2.00 per color (not including 1st color) per menu cover. This process involves the fabrication of a metal die that imprints and recesses your logo onto your product with the application of foil colors. Please note that foil chemical properties can vary from color to color and, therefore, certain product/foil combinations may not be appropriate. Color proofs are provided via email at no additional charge. Gold, Silver, Black – Other colors available upon request. This process involves the fabrication of a metal die that imprints and recesses your logo onto your product without the application of foil colors. Color proofs are provided via email at no additional charge. 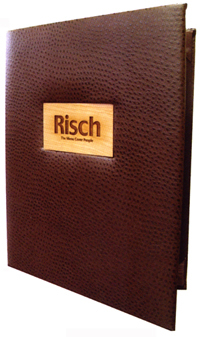 This process involves laser etching of your logo onto the wood cover. $120.00 One-time fee applies. Oversized logos may incur additional pre-approved fee. No foil colors available. Orders for customized samples of products prior to full production runs can be produced. Your foil stamp / blind deboss fee ($120) will apply (not incurred again at full order placement unless the logo or logo size changes). An additional labor / set-up fee of $90.00 also applies. Color proofs / spec sheets are provided via email at no additional charge for all customized products. Proof approval must be verified and returned via email or fax prior to order proceeding to production. Please note that some changes to proofs may be chargeable. 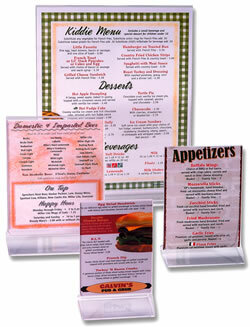 Quotes assist you in the overall assessment of your menu cover project. Our estimates provide you with your net pricing, customization and production lead times upon request. Minimums are set to provide you with the best available price. Some products can be produced for less than the stated minimums, however a $90 fee generally applies. Please call for details. All sizes referenced on this website are the actual “insert” size (Insert=Paper). 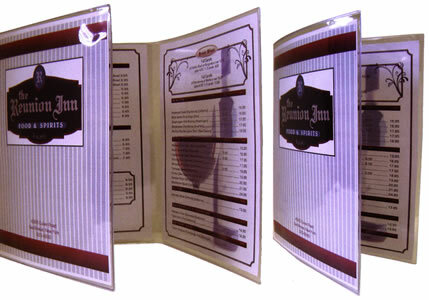 For example, when ordering an 8.5” x 11” menu cover, the inserts going into each pocket will measure 8.5” x 11”. 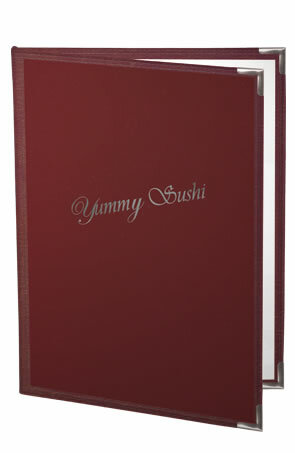 Custom sizes are available in many different menu cover styles. Please call for quotes. Visa, MasterCard, American Express, certified checks and checks and are accepted. Personal Money Orders are not accepted. · Credit Card Billing Address. When paying by credit card, the ship to address that you provide us must generally be the same as your credit card billing address. If it is different, then we will request pre-payment by check, and we must wait until your check clears before goods are shipped. Color representations on this website may vary slightly from actual material colors. Material colors can vary based on dye lots. For precise color-matching, material swatches are available for all products. Production lead times vary by season and volume of in-house orders. Please advise of deadlines as every effort will be made to accommodate your reasonable schedule. Expedited shipping, at your expense, may be necessary to insure meeting your in-hand date. Shipping and Handling charges are FOB Rochester, NY. All orders are shipped via UPS unless otherwise specified. We are not responsible for delays in transit. Customers may provide their own UPS, FedEx, and DHL account numbers, if preferable. Priority Ship Dates may be available for customized orders. Chargeable expedited shipping may be necessary to accommodate your deadlines. Fuel prices are in constant flux, and therefore shipping charges are no longer provided on the website. However, all shipping charges will be advised, and your approval sought, before any order is processed, even if you've placed your order on this website. •	Zip Codes beginning with 0, 1, 2 - 1 to 2 business days. •	Zip Codes beginning with 3, 4 - 2 to 3 business days. •	Zip Codes beginning with 5, 6, 7 - 3 to 4 business days. •	Zip Codes beginning with 8, 9 - 4 to 5 business days. MenuCoverMan.com is not responsible for delays in transit. Yes, we regularly ship to Alaska and Hawaii, Canada, Puerto Rico, Guam, the Virgin Islands, and all territories and possessions of the United States. •	A Return Authorization (RA) Number is mandatory and can be issued by a Customer Service Representative within 10 days (only) of customer’s receipt of product. For ID purposes, Return Authorization Numbers must be clearly marked on the outside of all packages being returned. •	Returns must be received within 10 days of Return Authorization Number being issued. •	An authorized return may be returned for replacement or credit, less 25% restocking fee and only after inspection and approval. •	All returns must be in the same condition as originally received. •	Customized and non-stock items are non-returnable. Products should be maintained by wiping exterior with a slightly damp cloth. No chemicals should be used on any products. We do not recommend menu boxes for storage. The chart below indicates imprints generally available for many MenuCoverMan products. You can greatly enlarge the imprints much bigger than life size, in order to see with 100% certainty the typestyle and the mood it creates. Simply click anywhere in the chart below. It's all made with Macs.